It is the start of another week - unfortunately, towards the end of last week my laptop crashed and I lost all my files (at this stage). The technician at school will need a couple of days to look at it and see if it is fixable, as well as trying to save my files. If you are reading this right now - go and back up your files right NOW!!! You never know what might happen to your computer! 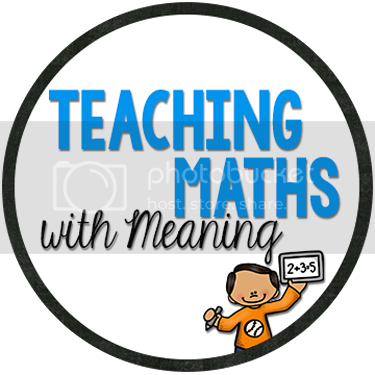 As I have spent all weekend buying a new computer, loading programs onto it, rewriting my planner for this week and rewriting my report cards that I lost, I don't have a new Maths Game Monday for you today, instead, I decided to revisit a post from earlier in the early! 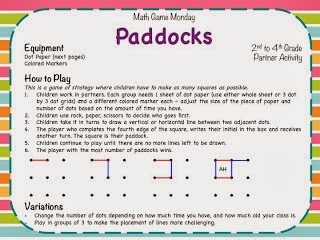 This past week, we have been playing paddocks as our warm up to our Area and Perimeter lessons. The children have loved it! We gave them a whole sheet of dots to work on and it certainly kept them busy - we played about 10 mins a day with the same partner for the week. If you missed this post, you can download it by clicking on the photo and following the link! For all you loyal readers, I promise I will have my computer sorted and will have a new game for you next week! Oh boy, I must do a back up too. I went and backed up as soon as I heard! Good luck with getting all your files. Hope your laptop gets fixed soon. Good luck with it! Hmm, that's quite interesting way to teach math. I know that a lot of children face with problems when it comes to math. And it's not only the problem of the smaller students. It's also about more adult ones. And I'm really happy there is this site for college students , where I can get help with my math problems.